“Barely half of 30-year-olds earn more than their parents did at a similar age, a research team found, an enormous decline from the early 1970s when the incomes of nearly all offspring outpaced their parents. Even rapid economic growth won’t do much to reverse the trend,” the Wall Street Journal is reporting. “Economists and sociologists from Stanford, Harvard and the University of California set out to measure the strength of what they define as the American Dream, and found the dream was fading. They identified the income of 30-year-olds starting in 1970, using tax and census data, and compared it with the earnings of their parents when they were about the same age. 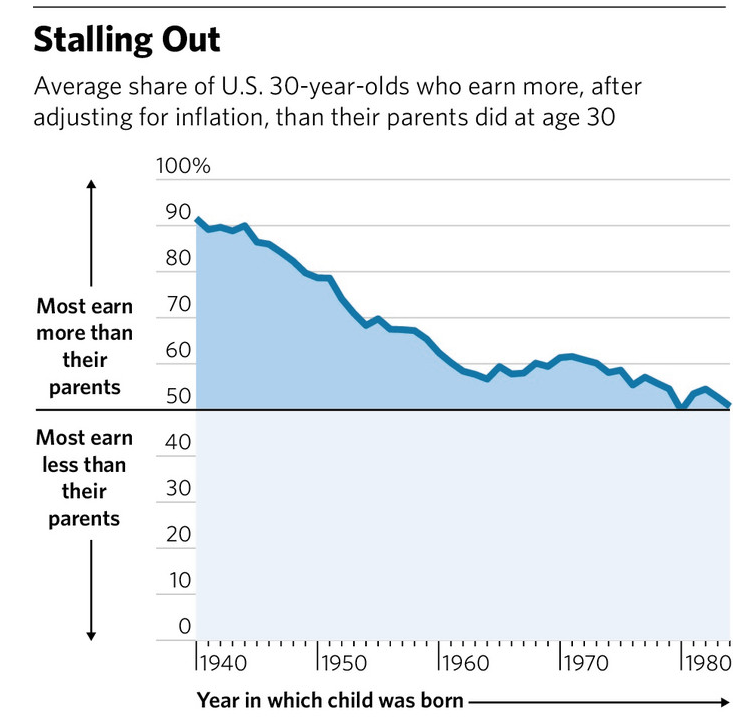 “In 1970, 92% of American 30-year-olds earned more than their parents did at a similar age, they found. In 2014, that number fell to 51%.